We will live to vividly remember April 28th 2018 when we visited home and made historic re-union with the fans, friends, family and well-wishers. It was such a humbling welcome as we-reconnected and caught up on some social issues. We were also reminded of the euphoric 1980 experience when we had our independence. The excitement we had that night remains indescribable. ​Thank you all. Tinotenda. Siyabonga. Aluta Continua! 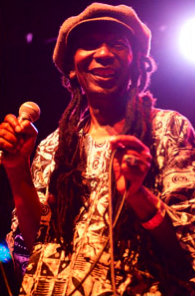 Thomas Mapfumo Live @ The Sanctuary For Independent Media 10th Anniversary” ON Sale Now! On this unique compilation, Dr. Thomas Mapfumo & the Blacks Unlimited perform before a live audience celebrating the tenth anniversary of the human-rights-conscious Sanctuary For Independent Media in Troy, New York. The performance fuses old and new beats to level out fan preferences while enhancing the spice of Chimurenga variety. Presented as a double album, Part 1 of the compilation consists of tunes like Mugarandenga, (a remix of an eighties hit), Chikonzero (The cause), Karigamombe (The Champion), Shebeen(The Night Spot), Vechidiki (Youth Beware) and Zimbabwe. Part 2 is purposefully aligned to underpin a pressing political message about the post-independence crisis in Zimbabwe. Through songs like Danger Zone, Dr. Mapfumo bemoans the looming threat to world peace through acts of violence, terrorism and cruel dictatorships. The plea for global peace resonates with the burning restlessness in Zimbabwe where many are wallowing in poverty due to leadership corruption and lawlessness. Resultantly the anxious masses are intermittently taking to the streets to protest as they lawfully demand government accountability. Wars, terrorism, dictatorships and various other government big-headedness issues are setting this world ablaze. On the song “Chikwereti” Dr. Mapfumo makes a political statement against odious debts that poor countries like Zimbabwe keep acquiring from rich nations like China or the West as foreign aid. Instead of the borrowed funds being prudently applied to develop poor nations, leadership greed and corruption are triggering Third World leaders to siphon the funds to off shore personal accounts. After the heavy-duty political messages on the compilation, Dr. Mapfumo lightens up a bit as he invokes some reminiscence through old tunes like “Pidigori” (The infamous braggart is dead), Chiruzevha Chapera (End of colonial restrictions), and Maria (a beautiful lady), a bonus track. The prominent piece on the entire compilation “Chinogiya” is presented live as a special offering to harbinger an upcoming hot album that Dr. Mapfumo will be releasing in December 2016. Dr. Mapfumo and the Blacks Unlimited band are forever grateful for the fans support. Please “like” him on Facebook or follow him on Twitter @chimurengamusic. Danger Zone is a 2015 album released by Dr. Thomas Mapfumo (aka The Lion of Zimbabwe) and The Blacks Unlimited. Since the 70s, Dr. Mapfumo has solely written his Chimurenga music genre that he has consistently performed. Chimurenga, a term that resembles a struggle for peace and freedom carries a powerful theme for social justice. Dr. Mapfumo performs with the aid of the mbira instrument (a powered thumb piano). The dreadlocked Dr. Mapfumo who has become a voice of the voiceless on social justice issues, began his music career by playing western music upon forming his band in 1978. He would be famous for a new style of Shona language music with quick hi-hat rhythms supported by irresistible mbira tunes. That Chimurenga theme lured many to reignite their confidence in local music. On the album Danger Zone, Dr. Mapfumo brings a mixed cocktail of themes ranging from troublesome wars, alcohol abuse, love, music and life. On songs like “Hatidi Politics” Dr. Mapfumo hits hard on politicking politicians who take the electorate for granted. Then on “Pasi idandaro” he reminds many not to take life for granted because life it’s just a short-lived dream. In general this album is well arranged and the variety it carries is impressive. It covers a wide spectrum of rhythms like reggae, jazz and pop. Dr. Mapfumo has a sonorous voice that is engagingly appealing. The sparkling fusion of guitar, mbira and horns rhythms makes the album a must-have. 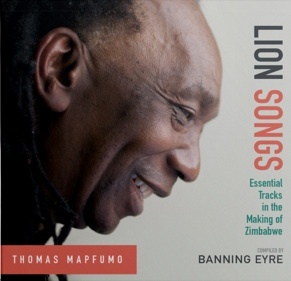 Affectionately known at home as “Mukanya” (“Baboon”) and to the rest of the world as the “Lion of Zimbabwe’, Thomas Mapfumo has been a witness and participant of the history in his native country, Zimbabwe. From the bloody years of the country’s liberation war in the 1970’s, right through the present economic and political cries, Mapfumo has used his revolutionary, spiritually charged music to decry injustice and highlight the historical and cultural issues that underlie the news headlines. Mapfumo is a musical visionary, fearless social critic, and certainly one of the greatest African bandleaders of the past century.